We got up at 6h30 as usual. The night was cold and humid. Another sunny day greeted us. In silence we ate our granola and packed. 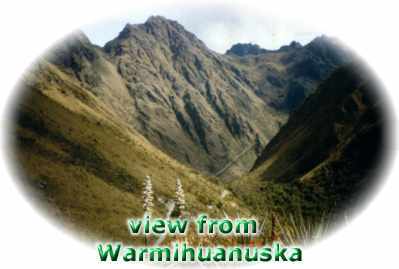 A climb of a few hundreds meters was enough to arrive at Warmihuanuska or the "Death Woman's Pass" in Quechua. The mountains are creators of illusions if we speak about distances. It was possible to see people at the summit of the trail sitting down and overlooking the other side of the mountain. "A piece of cake", we all thought. But the more one thinks the top is reached the longer the distance gets. Better is not to think about it and simply continue. Our chasquis walked passed and arrived little later at the summit, looking at us and joking about us. They only speak in Quechua but we gringos who live a long time in Latin America know that. When you ask them how far it is to the summit, they'll say "half an hour" if it is in reality 2 hours. Time and distance is simply not important to an Indian. Shortly after arrival Zenon and the two chasquis continued the Trail. We were going to meet each other later on at the campsite. From this spot we could see the ruins of Runcuraqay. This half round temple like building is situated at the other side of the valley. First we had to undertake a 1000m-dizzying dive to the campsite where the 3-day hikers usually spend their first night.